Everyone is expanding their SUV portfolios, adding new cars in their line-up to offer a crossover for any and every want of the new age car buyers. 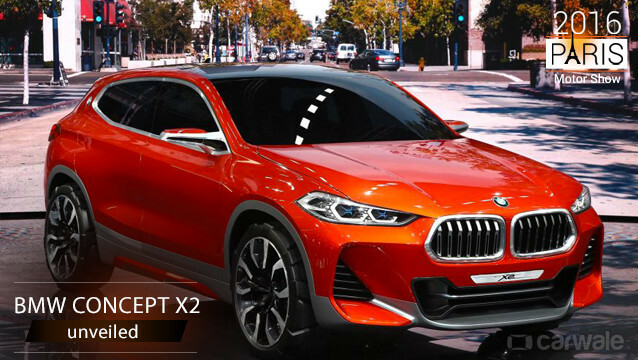 BMW is not going to be left behind and have revealed the BMW Concept X2, a sportier crossover SUV based on the BMW X1 and plugging the gap between the X1 and the X3. Built on the same platform as the Mini Countryman, the X2 does not toe the expected hideous coupe lines of the X4 and the X6. The BMW X2, in fact, turns out to be a looker with the large grille, huge vents in the sculpted air dam and a grey treatment to the lower half. The raked C-pillar, flared wheel arches and the small windscreen in the back gives it a muscular squatted stance. “The concept displays a new and exciting facet of the BMW brand within the compact segment. The BMW Concept X2 is a vehicle for active people looking for a combination of enjoyment and practicality,” says BMW’s senior VP Adrian van Hooydonk. The BMW X2 will also turn out to be front-wheel drive car and might get four-wheel drive as an option. While the standard four cylinder petrol and diesel engines will certainly be there, the chances of the straight-six Ms getting under the hood seem bleak as of now. But being BMW, they would certainly engineer their way out to get us an X2M. Looking at the fast turnaround times of product lifecycles, you can expect BMW to start test mules of a production ready car within a year and an unveiling probably in 2018.